Sif is the wolf companion of Sir Artorias, the Abysswalker. 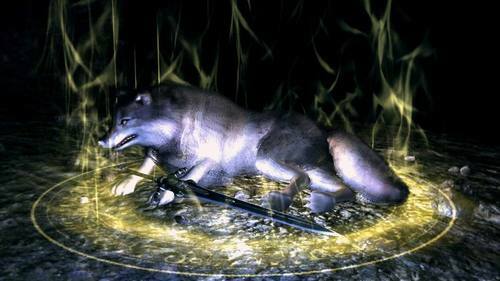 After Artorias passed away, Sif became the guardian of Artorias' grave in the Darkroot Garden, to prevent others from meeting the same fate as his former master. 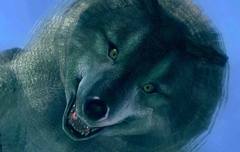 A younger Sif appears in Oolacile in the past. He accompanied Artorias on his quest to save Oolacile from the forces of the Abyss. However, Artorias and Sif were overrun, and the former used his shield to erect a barrier around Sif to protect him before he became corrupted. According to that, Artorias would be the counterpart to Thor. In the norse mythology he is (among other) the protector of Midgard (the Realm of humans) or the humankind respectively. Imagine he came to Oolacile to battle the threat that lurks below oolacile, the town would be the counterpart to Midgard he wants to protect. This does also underline the theory that Oolacile is the cradle of human in the Souls universe (and the realm of humans in is time). This ring symbolizes Knight Artorias' covenant with the beasts of the Abyss. It's wearer, like Artorias himself, can traverse the Abyss. who guards the grave of Artorias the Abysswalker.